The Khmer kings wanted more. You’d think the royal palace at Angkor and its sprawling parade ground rumbling with elephant fights and polo matches would be impressive enough. But Khmer kings in the thirteenth century rivaled the gods in real estate development. Claude Jacques thinks that most of the Leper King Terrace was built in the late 13th century. 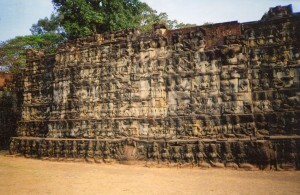 It’s a northern extension of the Elephant Terrace, which is a nearly 1,000 foot carved wall that the royal palace presided over. 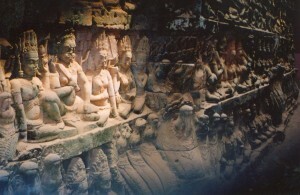 The Leper King Terrace presents a very crowded neighborhood of divinities. Gods are shown with their consorts. Some look nice; others have eyes that a boxer wouldn’t want to see in his opponent. Nagas (snakes from ancient Indian mythology which were associated with fertility) and apsaras (celestial female dancers who entertained the gods) bump and grind with everybody else. The royal family probably used the Leper King Terrace as their cremation ground. If all these figures were afterlife companions, it doesn’t look like the king was expecting much peace. The first two pictures are of the terrace’s outer wall. The above shot’s of an inner corridor behind the outer wall. It’s dense too. 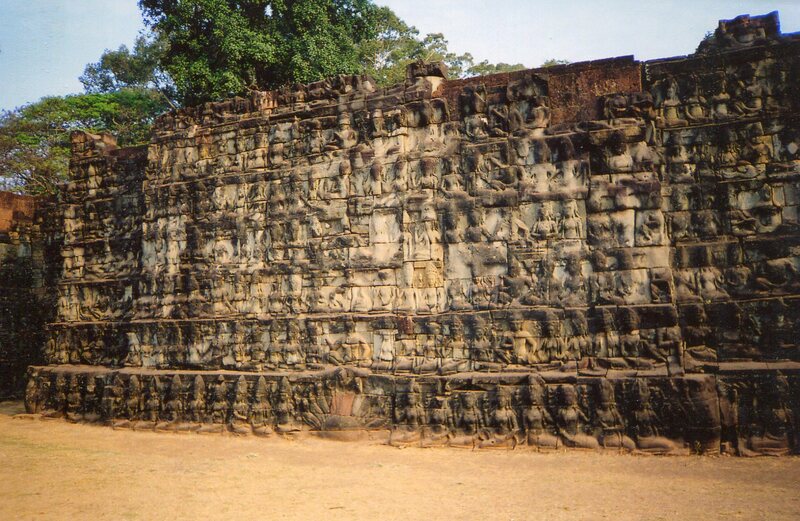 You can see multi-headed nagas in the lower middle part, and more gods and consorts not seeming to do very much because they’re crammed so tightly together. Some specialists have thought that the inner part represents the underworld. Whether it does or not, the outer side doesn’t look too different. I felt rather uncomfortable around the Leper King Terrace. It had none of Angkor Wat’s limber apsaras dancing with joyful expressions, and none of its soaring pineapple shaped towers replicating Mt. Meru. Maybe resources were limited by the late 13th century. 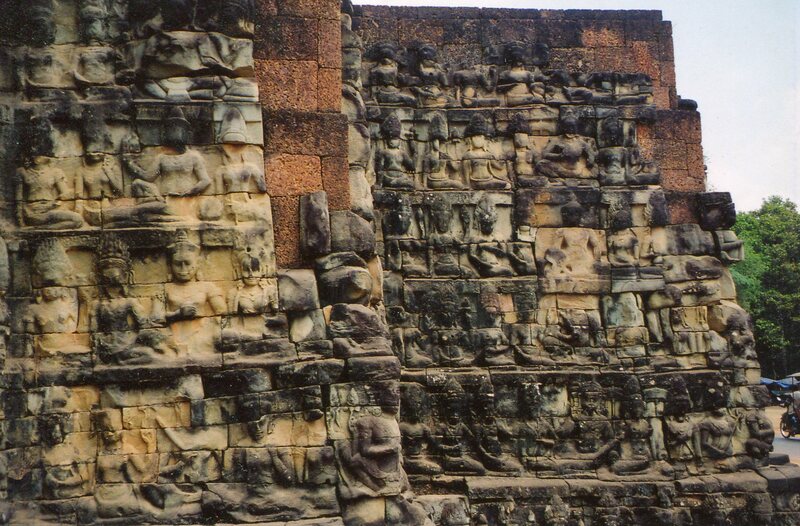 The Khmers had done most of their temple construction, and people in today’s Thailand had gained independence–the Khmer Empire lost much of its revenue-producing land. The terrace looks as though the kings wanted to cram as many figures into as little space as possible. But though the Leper King Terrace seemed like a decline in Khmer finances and aesthetics, it was a fitting addition to the palace grounds. The whole place projects might–the huge Elephant Terrace and royal palace, the thunderous festivals on the parade ground, and the stately buildings on the other side of the parade ground reinforce each other as the center of political order on earth. The Leper King Terrace punctuates the effect. But it also suggests fear that the majesty that the Khmer Empire was based on was fragile in that time of stressed resources. Khmer nobles were still reaching for the sky, but worrying about their footing. 2. Meeting halls in Thai temples.